^ Gravett 2007, p. 187. ^ Chelminski 1997, p. 90–100. ^ Marks 1978, p. 249. ^ Smith 2003, p. 11. ^ Young 2005, p. 20. ^ 6.0 6.1 Roth 2010, p. 6. ^ Romanych & Rupp 2010, p. 8. ^ Kaufmann & Kaufmann 2006, p. 5. ^ Kaufmann & Kaufmann 2006，Introduction. ^ Kaufmann & Kaufmann 2006, p. 122. ^ Allcorn 2003, p. 43. ^ 12.0 12.1 Allcorn 2003, p. 44. ^ Seramour 2007, pp. 86-97. Young, Robert. An Uncertain Idea of France. New York: Peter Lang. 2005. Keylor, William. The Twentieth-Century World. Oxford: Oxford University Press. 2001. Frieser, Karl-Heinz. The Blitzkrieg Legend. Naval Institute Press. 2005. ISBN 978-1-59114-294-2. Allcorn, William. The Maginot Line 1928–45. Oxford: Osprey Publishing. 2003. ISBN 1-84176-646-1. Cain, Syd. Not Forgetting James Bond. Richmond: Reynolds and Hearn. 2005. ISBN 978-1-905-28703-1. Zaloga, Steven. Operation Nordwind 1945: Hitler's Last Offensive in the West. Osprey. 2010. ISBN 978-1-84603-683-5. Jackson, Julian. The Fall of France: The Nazi Invasion of 1940. Oxford: Oxford University Press. 2003. ISBN 978-0-192-80550-8. Romanych, Marc; Rupp, Martin. Maginot Line 1940: Battles on the French Frontier. Oxford: Osprey. 2010. ISBN 978-1-846-03499-2. Gravett, Christopher. The History of Castles: Fortifications Around the World. Globe Pequot. 2007 [19 April 2013]. OCLC 495191912. Smith, Leonard; Audoin-Rouzeau, Steéphane; Becker, Annette. France and the Great War, 1914–1918. Cambridge: Cambridge University Press. 2003. Roth, Ariel Ilan. Leadership in International Relations: The Balance of Power and the Origins of World War II. Palgrave Macmillan. 2010. ISBN 978-0-230-10690-1. Donnell, Clayton. Maginot Line Gun Turrets: And French Gun Turret Development 1880–1940. New Vanguard. Oxford: Osprey Publishing. 2017. ISBN 978-1-47282-029-7. 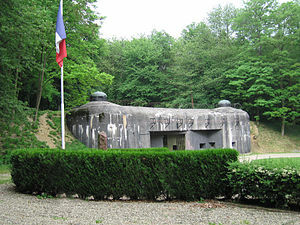 Kaufmann, J. E.; Kaufmann, H. W. Fortress France: The Maginot Line and French Defenses in World War II. Mechanicsburg, PA: Stackpole Books. 2006. ISBN 0-275-98345-5. Nichols, Kenneth D. The Road to Trinity: A Personal Account of How America's Nuclear Policies Were Made. New York: William Morrow and Company. 1987. ISBN 0-688-06910-X. Ambrose, Stephen. Citizen Soldiers: The U.S. Army from the Normandy Beaches to the Bulge to the Surrender of Germany Jun 7, 1994-May 7, 1945. London: Simon & Schuster. 2016 . ISBN 978-1-471-15833-9. Chelminski, Rudolph. The Maginot Line (PDF). Smithsonian. 1997: 90–100 [26 June 2012]. （原始内容 (PDF)存档于2 December 2007）. Marks, Sally. The Myths of Reparations. Central European History (Cambridge University Press). September 1978, 11 (3): 231–255. JSTOR 4545835. doi:10.1017/s0008938900018707. Seramour, Michaël. Histoire de la Ligne Maginot de 1945 à nos jours. Revue Historique des Armées (Revue Historique des Armées). 2007, (247 Le renseignement): 86–97 （法语）.